tree snails of Florida - Drymaeus spp., Orthalicus sppp., Liguus spp., Bulimulus spp. Many snails are found in trees, but only a few are exclusively arboreal for most or all of their life cycle. Tree snails are normally found on the ground only during egg-deposition or when dislodged from their perches. They are frequently large, up to 70 mm long, but tend to be smaller in colder areas. They are restricted to tropical and semi-tropical regions by their need for high humidity and warm temperatures. Tree snails are included in several families, but the Bulimulidae and the Pupillidae are the only two represented on the United States mainland. In the Americas, the center of diversity of the Bulimulidae is in northern South America to Brazil, with representatives spreading northward through Central America and the Caribbean to the southeastern United States (Solem 1969, Breure 1979). The bulimulids are not exclusively arboreal as many species live in leaf-mold, under or near rocks, or on rock faces. However, all native Florida bulimulids are arboreal. The United States has four native genera of Bulimulidae: Rhabdotus, Drymaeus, Orthalicus, and Liguus. The last three genera are native to Florida. There is also one recently introduced genus in Florida, Bulimulus, which is primarily terrestrial (Thompson 1976). The systematic relationships of the native species were summarized by Pilsbry (1946). The arboreal representatives feed on epiphytic growths such as algae, fungi and lichens on trees. Figure 1. 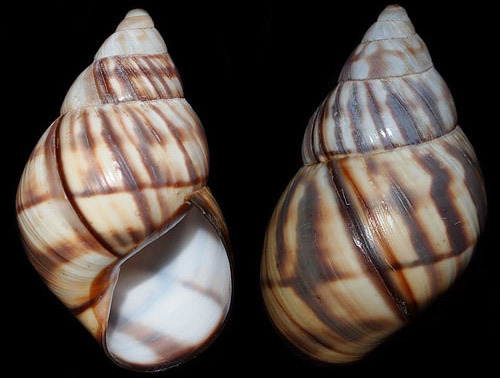 Orthalicus reses (Say) [left], a federally listed threatened species, and Achatina fulica (Bowditch) [right], a major agricultural pest similar in appearance to Orthalicus reses. Photographs by Division of Plant Industry. Orthalicus reses (Say) is a federally listed, threatened species due to restricted range and habitat destruction and cannot be legally collected without a federal permit. Liguus fasciatus (Müller) has been proposed as an endangered species in the past but has not been so designated. Most of the other native Florida bulimulids appear to be wide-ranging and numerous. Except for scientific study, these snails should not be collected, as they are not agricultural pests and may actually be beneficial, because they feed on epiphytic growths. The bulimulids of Florida have ovate-conical or bulimoid shells that at maturity range in size from 15 mm to 70 mm. 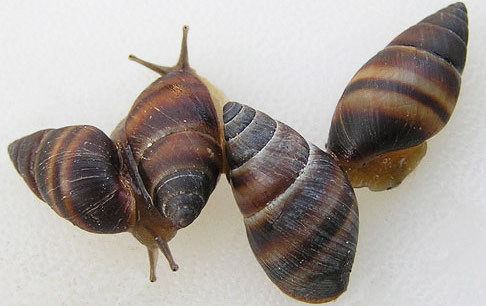 With the exception of Liguus fasciatus, these snails have shells that vary in color from ivory to tan, often with brown markings. Liguus shells are brilliantly colored and are frequently marked with yellow, green, pink, and brown. The bulimulid shell surface is smooth, sometimes glossy, and with protuberances. Live snails are most often found in native hammock trees and shrubs, but frequently live in citrus groves and backyards. Figure 2. Key identification features. Drawing by Division of Plant Industry. 3(2'). Shell with vertical chestnut brown stripes, blue to black apex . . . . . lined tree snail, Drymaeus multilineatus (Say, 1825). Brown subsutural and basal bands are also present, and can be as wide as 2 mm in some Keys specimens, or lacking altogether. This species is found on terminal twigs of both native and exotic trees and shrubs in the southern counties of Florida, in the Florida Keys, and in the Caribbean. 3'. Shell lacking vertical stripes, apex brown to ivory . . . . . West Indian Bulimulus, Bulimulus guadalupensis (Bruguière, 1789). This shell is marked by one to two faint or three strong brown spiral bands and a narrow white subsutural band. Introduced from Puerto Rico, this species is found on low-lying ground-covers and in lawns in southeastern Florida and is moving northward. In addition, in 2009 and 2010, populations were reported in Duval and Nassau counties, approximately 200 miles north of confirmed populations (Frank and Lee 2010). Figure 4. The West Indian Bulimulus, Bulimulus guadalupensis (Bruguière, 1789). Photograph by Bill Frank, www.jaxshells.org. 4(2). 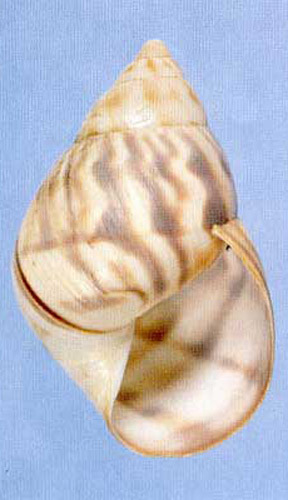 Shell 25 to 30 mm, with 3 to 4 wide spiral rows of chestnut-brown squares on the body whorl, lip of aperture in mature shell slightly flared . . . . . Manatee treesnail, Drymaeus dormani (Binney, 1857). The markings can be faint to lacking in some specimens. This species is endemic to North and Central Florida north of Lake Okeechobee, and has been reported on palmetto, orange and grapefruit trees (Pilsbry 1946). Figure 5. The manatee treesnail, Drymaeus dormani (Binney, 1857). Photograph by Phil Poland, www.jaxshells.org. 4'. Shell 15 to 25 mm, with 3 to 5 irregular narrow brown bands on the body whorl, lip of aperture not flared . . . . . Master treesnail, Drymaeus dominicus (Reeve, 1850). The bands can be unevenly broken or even lacking. 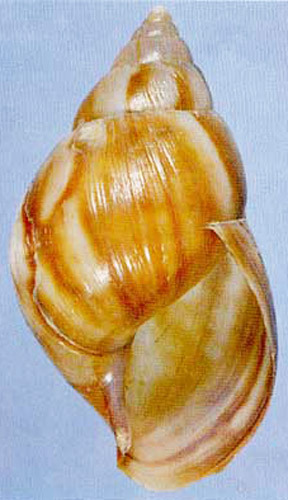 This species can be differentiated from Drymaeus dormani by the rounder whorls, smaller adult size, and lack of a flared apertural edge. It is found on citrus and native trees in southeastern Florida south of Lake Okeechobee to the Florida Keys and parts of the Caribbean. Figure 6. The master treesnail, Drymaeus dominicus (Reeve, 1850). Photograph by Phil Poland, www.jaxshells.org. 5'. Length of aperture less than half overall length, shell heavy and porcelain-like, aperture white to faintly pink inside . . . . . Florida tree snail, Liguus fasciatus (Müller). The color patterns in this species are extremely variable. At this time, there are 58 named color forms in South Florida and the Florida Keys (Davidson 1965, Jones 1979, Diesler 1982), with others in Cuba. This animal is generally found on smooth-barked trees in native hammocks. Figure 7. 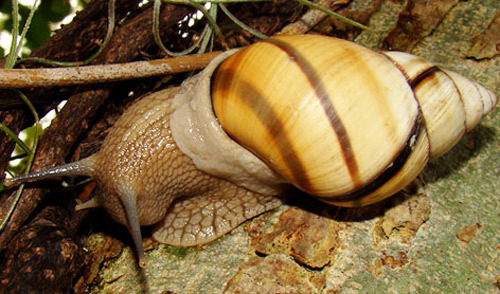 The color patterns of the Florida tree snail, Liguus fasciatus (Müller), are extremely variable. Photograph by Bill Frank, www.jaxshells.org. 6'. Shell lacking flame-like stripes . . . . . banded tree snail, Orthalicus floridensis Pilsbry, 1891. This is the largest Florida tree snail, and is tan with two to three spiral brown bands and one to four dark brown vertical growth lines. Both the margin of the aperture and the parietal callus are dark brown. This native species is endemic to South Florida and the Florida Keys on native and introduced trees. Figure 8. 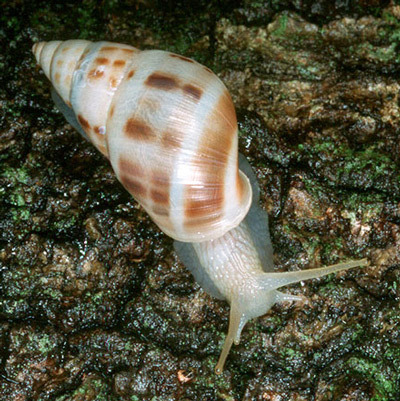 The banded tree snail, Orthalicus floridensis Pilsbry 1891, is the largest Florida tree snail. Photograph by Robert Pilla, www.jaxshells.org. 7(6). Apex white, parietal callus clear or faintly chestnut . . . . . Stock Island tree snail, Orthalicus reses reses (Say, 1830). This snail and the next subspecies, Orthalicus reses nesodryas Pilsbry, have been confused with the foreign snail Achatina fulica (Bowdich). However, they can be differentiated from Achatina fulica because they have a greyish cast (never reddish) to the stripes, underlying spiral bands, and a columella continuous with the aperture, not truncate. Orthalicus reses reses is endemic to Stock Island, Monroe County, where it is found on a variety of native and exotic trees. Figure 9. 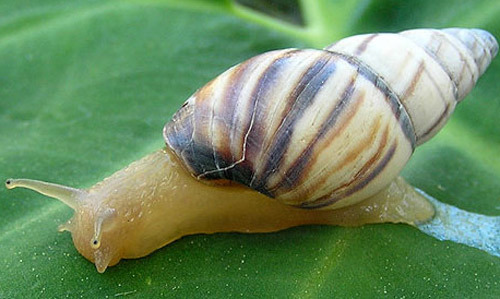 The Stock Island treesnail, Orthalicus reses reses (Say, 1830). Photograph by Bill Frank, www.jaxshells.org. 7'. Apex and parietal callus dark chestnut-brown . . . . . Florida Keys treesnail, Orthalicus reses nesodryas Pilsbry, 1946. This subspecies is endemic to the Florida Keys, from Lower Matecumbe Key to Key West, and can be found on a variety of host trees. Figure 10. The Florida Keys treesnail, Orthalicus reses nesodryas Pilsbry, 1946. Photograph by Bill Frank, www.jaxshells.org. Breure ASH. 1979. Systematics, phylogeny and zoogeography of Bulimulinae. Zoologische Verhandelingen, Leiden, No. 168. 215 pp. Davidson T. 1965. Tree snails, gems of the Everglades. National Geographic 127: 372-387. Deisler JE. 1982. Florida tree snail. In Prichard PCH. (ed. ), Rare and Endangered Biota of Florida: Invertebrates 6: 15-18. Frank B, Lee H. (June 2010). Bulimulus sp. aff. guadalupensis (Bruguière, 1789) West Indian Bulimulus. http://www.jaxshells.org/gallery5.htm (8 December 2014). Jones AL. 1979. Descriptions of six new forms of Florida tree snails. Nautilus 94: 153-159. Pilsbry HA. 1946. Land Mollusca of North America. Academy of Natural Sciences Philadelphia Monographs 3: 1-520. Solem A. 1969. 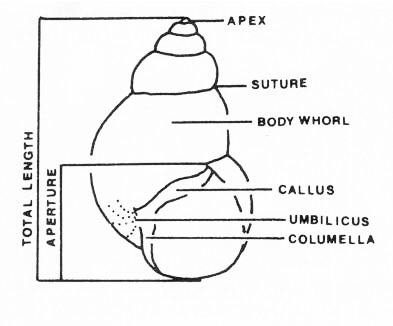 Basic distribution of non-marine molluscs. Symposium on Mollusca, Proceedings of the Cochin 1968 Marine Biology Association India. Symposium Series 3: 231-247. Thompson FG. 1976. 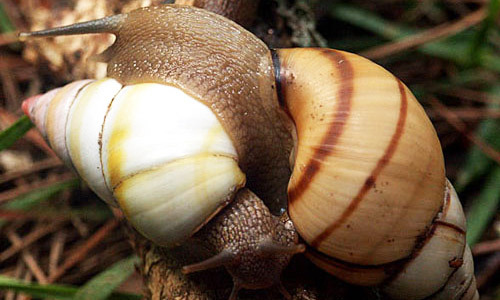 The occurrence in Florida of the West Indian land snail, Bulimulus guadaloupensis. Nautilus 90: 10. Author: Jane E. Deisler, Florida Department of Agriculture and Consumer Services, Division of Plant Industry. Originally published as DPI Entomology Circular 246. Updated for this publication. Publication Date: August 2000. Latest revision: December 2014. Reviewed: December 2017.